February, 2013 | Coptalk.Info - What you do not know will shock you! Think of your home’s first line of defense — what comes to mind? 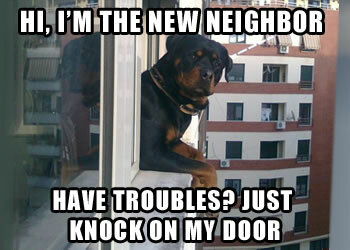 Your security system? Your barbed-wire fence? Your adorable but secretly vicious poodle? All of these will do in a pinch, but cast the net a little wider and you’ll find security starts up the street, around the corner, and everywhere in between. Statistics show that ⅔ of people feel safer in their homes because they know their neighbors, which makes sense when you learn about some of these hometown heroes. Read on to see how these neighbors have earned their stripes, and how you can, too. On December 24th, 2012, three young Colorado Springs burglars decided they wanted a new car for Christmas. Knowing that a lot of families would be gone for the holidays, they targeted an empty apartment, broke in through the back door, found the car keys, and got ready to ride off into the sunset. And they would have gotten away with it, too — if it weren’t for Chris Willner, a resident who knew his neighbors were away and that no one was supposed to be in their house. As the burglars yakked it up in the stolen car, Willner approached them and asked what they were up to — when they didn’t have an answer, he yanked the keys out of the car’s ignition, detained one of the criminals, and called the police. Mr. Rogers would be proud. Two things stopped this burglary — that the homeowners were savvy enough to tell a neighbor they were going out of town, and that the neighbor had enough guts (and observation skills) to stop the crime. If the victims had taken a few more precautions, though, they might not have been victims at all. Neighbors are great for keeping an eye out, but they can also help protect your home while you’re away by making it look like you never went away in the first place — picking up mail, cutting the lawn, clearing snow, even going through every once in a while to check on the place and flip some lights on and off. Make a pact with a close neighbor to trade off housesitting responsibilities, and you’ll be sure to come home to the same house you left. Back in August, a "self-appointed group of neighbors keeping an eye on things" slapped a poultice on a rash of car burglaries in Colorado Springs. The group had a phone chain in place to alert neighbors about suspicious activity, and when car alarms started going off all over the neighborhood, they used it. A few went after the would-be thieves with sticks, eventually cornering them behind some bushes. Two teenagers came out with their hands up, probably scared straight for life.